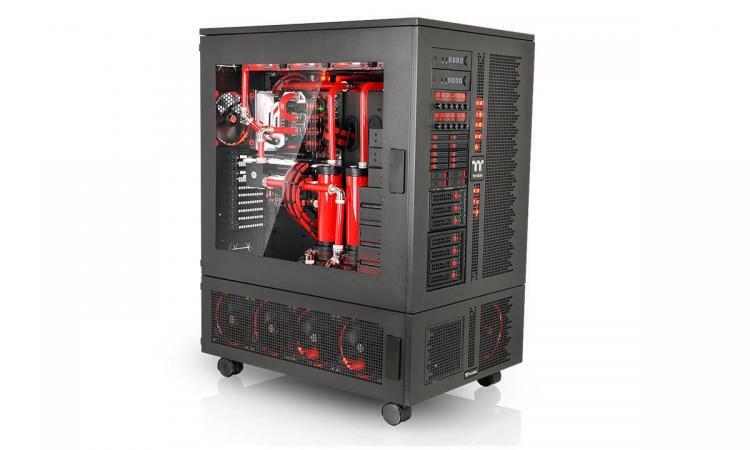 Thermaltake Updates The Core W Case Series With New Dual-System Designs. Taipei, Taiwan - April 14th, 2016 - Thermaltake has presented the latest TT Premium product line – the new Core W Series: Core W200 and Core WP200 super tower chassis with the Core P200 pedestal chassis – following after the Core W Series (WP100/W100), designed with the TT Premium core values of Excellent Quality, Unique Design, Diverse Combinations and Boundless Creativity to deliver versatility in different superior looks. Being the first dual system chassis with full assembly concept, the Core W Series is a great opportunity for makers to start from zero and experience true “DIY” by putting every piece together to complete a high-end system. The Core WP200/W200 is capable of housing more than twenty drive trays and up to ten expansion slots, which can be served as another workstation in the industrial field. With its unprecedented space for high-end hardware and liquid cooling expansion, the Core WP200/W200 supports the latest XL-ATX, E-ATX, ATX, Micro ATX, Mini-ITX motherboards, and also SSI MEB. All standard equipment for the chassis is included. Makers only need to purchase the custom liquid cooling components and incorporate externally-modular upgrades to build an aesthetically-superior water cooling chassis. With removable “3 + 14” drive racks and freely interchangeable SSD/HDD cage sections, the Core W200 offers more for maximum interior space. Take the advantage to include high-end, maximum capacity, cooling allotment without the reduction of GPU length limitations when incorporating liquid cooling expansion for the ultimate cooling performance. 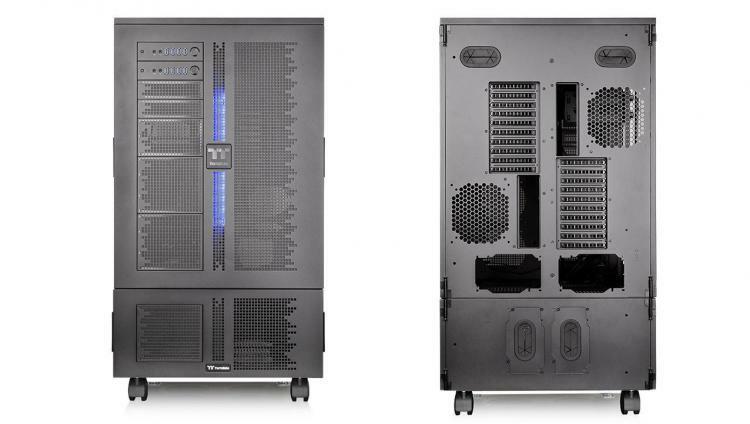 With more than 20 drive trays and 10 PCIe slots, the Core W200 can be used as another workstation for technical or scientific purposes, holding data or hosting a number of different features between computers. Compatible with the latest Intel processors and AMD/NVIDIA graphics cards, the Core WP200 delivers exceptional performance and creates an effective work environment. Due to the partition of the chassis, users are capable of putting two systems in the case. The Core W200 has room for XL-ATX, E-ATX, ATX, Micro ATX, and Mini-ITX builds. With two systems in one case, there are also two sets of I/O buttons located on the top front of the case. Designed for high-end gaming system and workstation compatibility, the Core W200’s modular drive racks allow makers to easily install up to more than twenty data storage devices, a dual slot VGA of up to 635mm in length, and a tower CPU cooler as high as 200mm. Even with a high-wattage PSU stretching to 220mm in length, there is still plenty of space for cable management. Moreover, a 360mm radiator can be installed in the front of the chassis, delivering superior cooling performance. The Core W200’s unparalleled cooling ability offers fan brackets with various mounting points to support any type of gaming system that can be accommodated, including DIY/AIO liquid-cooling systems and air-cooling units. Fans can be mounted anywhere inside the chassis: supports up to three 140mm fans at the front and a rear 140mm fan guarantees the flow of aeration; three large 200mm fans on the top panel as well as three 140mm fans at the bottom, while there are still rooms for 120mm, 140mm, and 200mm fans on both sides. With its stacking design, the Core W200 and the Core P200 create two different combinations: by stacking the Core P200 on the top or at the bottom of the Core W200. The mix and match of Core WP200 offers an expandable system allowing enthusiasts to incorporate externally-modular upgrades. 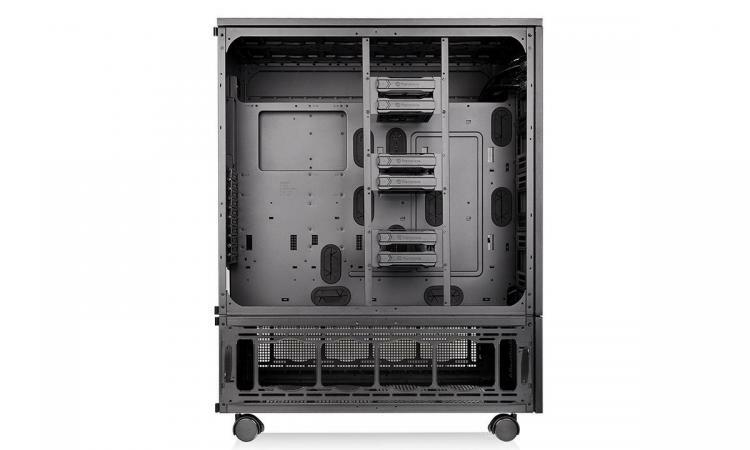 Stacked together, the chassis opens up space to expand the liquid cooling system, the storage solutions, and can even create dual systems, thereby enabling a dedicated top/bottom set-up for pure cooling. When stacked, the maximum radiator length supported is 600mm on the front side. With removable “3 + 14” drive racks and freely interchangeable SSD/HDD cage sections, the Core WP200 offers more for maximum interior space. Take the advantage to include high-end, maximum capacity, cooling allotment without the reduction of GPU length limitations when incorporating liquid cooling expansion for the ultimate cooling performance. Capable of housing more than 20 HDD drive trays and 10 PCIe slots, the Core WP200 can be used as another workstation for technical or scientific purposes, holding data or hosting a number of different features between computers. Compatible with the latest Intel processors and AMD/NVIDIA graphics cards, the Core WP200 delivers exceptional performance and creates an effective work environment. 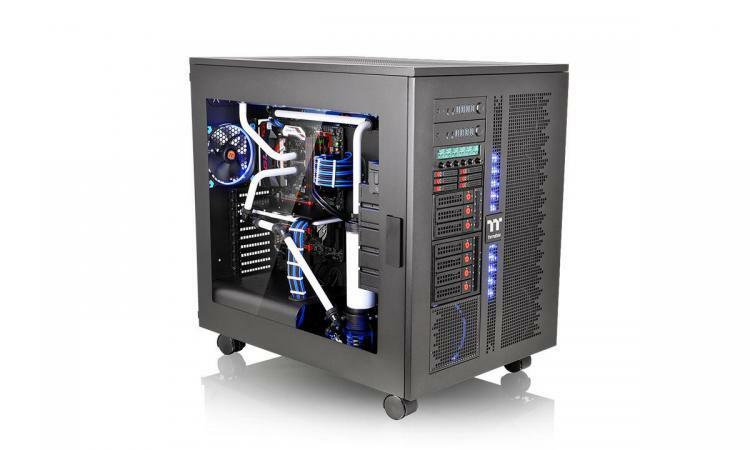 Due to the partition of the chassis, users are capable of putting two systems in the case. The Core WP200 has room for XL-ATX, E-ATX, ATX, Micro ATX, and Mini-ITX builds. With two systems in one case, there are also two sets of I/O buttons located on the top front of the case. Designed for high-end gaming systems and workstation compatibility, the Core WP200’s modular drive racks allow makers to easily install up to more than twenty data storage devices, a dual slot VGA of up to 635mm in length, and a tower CPU cooler as high as 200mm. Even with a high-wattage PSU stretching to 220mm in length, there is still plenty of space for cable management. Moreover, a 360mm radiator can be installed in the front of the chassis, delivering superior cooling performance. The Core WP200’s unparalleled cooling ability offers fan brackets with various mounting points to support any type of cooling you can dream of including DIY/AIO liquid-cooling systems and air-cooling units. 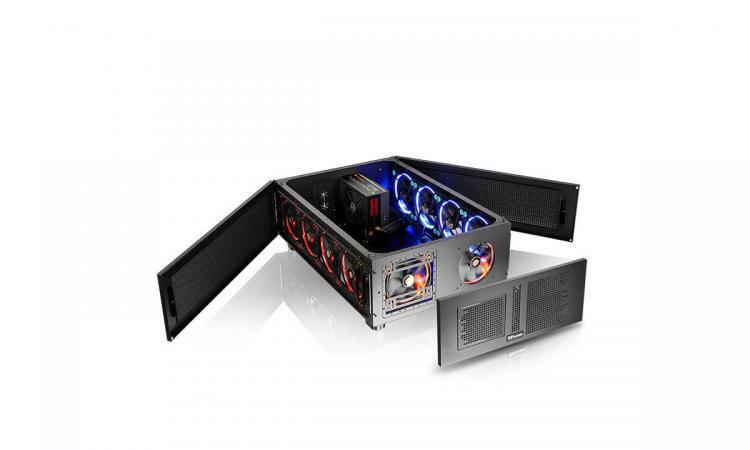 Fans can be mounted anywhere inside the chassis: support for up to eight 140mm fans at the front and a rear 140mm fan guarantees excellent airflow capabilities; three large 200mm fans on the top panel as well as six 140mm fans at the bottom, while there is still room for 120mm, 140mm, and 200mm fans on both sides. Expand your maker limits with the stackable Core P200 Pedestal (sold separately) for externally-modular upgrades, and boost your cooling and power capabilities.